No, really, the shotgun IS terrible. I finished up Tomb Raider the other night, story mode complete with the overall game completion at 78%. This means that I skipped a lot of climbing around for collectibles, I suppose, but it’s polite enough to allow me to go back and find them even though the end credits have rolled. 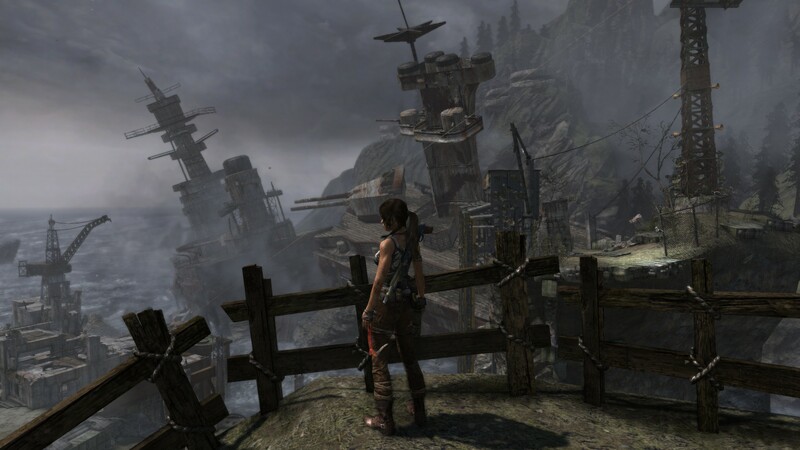 It might be worth it, because climbing around Yamatai island as Lara is just plain fun. Between the Prince of Persias and the Assassin’s Creeds and the Tomb Raiders, I play an awful lot of games where the main character spends most of their time climbing around on improbable architecture, and each one has its own feel. Prince of Persia is all about the environmental hazards and proper timing, Assassin’s Creed is all about treating buildings as slightly inconvenient speedbumps with occasional archers to stab, and Tomb Raider is usually a challenge of getting as much height as you can and then trying to decide which inconspicuous ledge represents a safe handhold and which will send you screaming to your death, and it’s usually fairly slow by comparison. This incarnation is a little less obtuse about which way you’re supposed to go at any given moment, which makes the clambering about much quicker. In places, it comes awfully close to the speed of the 2008 Prince of Persia game, which was almost rhythm-game speed in its more complex segments. For a series called Tomb Raider, some of the actual series entries don’t actually spend all that much time IN TOMBS, and this is one of them. There are a half-dozen challenge rooms scattered around the map, each of which is basically “here is a physics puzzle to solve”, and there are a couple of segments inside your typical ruined temples and the like, but most of the time is spent running around outside, usually with lots of enemies shooting at you. There’s a TON of shooting and being shot at in this iteration, by the way, and the odd bit of particularly brutal melee combat. It’s a change of tone that’s justifiable, mind you, because that the game is less “explore ancient tombs and find lost treasure” and more “you are on an island where everyone wants to kill you”, but it still feels weird that the common solution to many of your problems is to insert about a dozen arrows into the head parts of about a dozen guys. Speaking of which, the bow is fantastic in a way that I suspect no real bow is. I’m not going to quibble, but I did find the combination of range, stealth and lethality meant that I found myself going to the bow over, oh, the assault rifle or shotgun, and this just seems counter-intuitive. Of course, I may have already made my feelings about the shotgun clear. Ever since the days of Doom, the shotgun has been the go-to weapon for point-blank mans shooting. This particular one is not – from all the effect it has on enemies, I suspect that it’s loaded with rock salt rather than buckshot. I did manage to get the 40 shotgun kills necessary for the “shoot mans with the shotgun” achievement, eventually, and I can take some solace – and find some affirmation – in the fact that this is one of the rarer achievements in the single-player game. The story is, well, it’s an origin story, and origin stories are usually pretty fun – if not particularly deep. Lara starts off as a spoiled rich girl, bad things happen to her and those around her, and she eventually becomes the arsekicker that we all know and love. There are some fun twists along the way, lots of stuff explodes (occasionally with no good reason to do so), and presumably they are churning out the sequel with All Possible Speed. 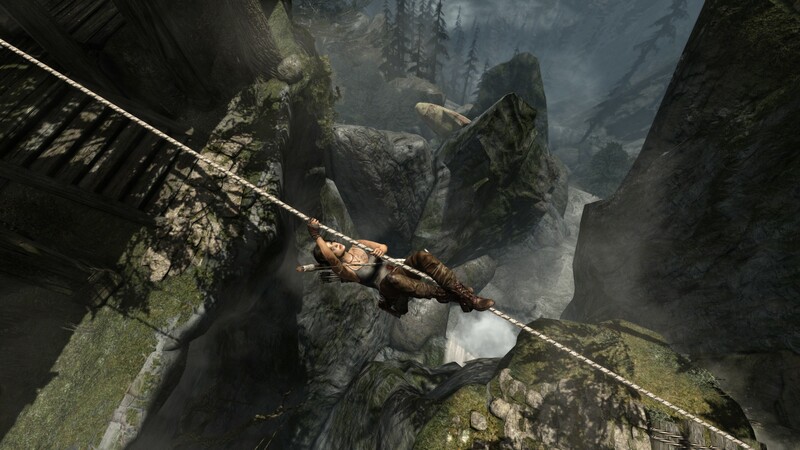 I will admit that I was a little hesitant to pick up Tomb Raider after the Big Damn Controversy surrounding some of the early trailers for the game – if you believe the massive hype and backlash that went on, it sounded like this was going to be I Spit On Your Grave, The Official Video Game. I feel a little silly about that now. Well, actually, I feel good about saving 25 bucks by waiting until the game was half-off to buy it, but that again is moderated by feeling silly that I waited until the game went to 75% off before even playing it. To sum up all the previous words: It’s an excellent game and you should own it. I leave you with some random screenshots that show off the Pretty.